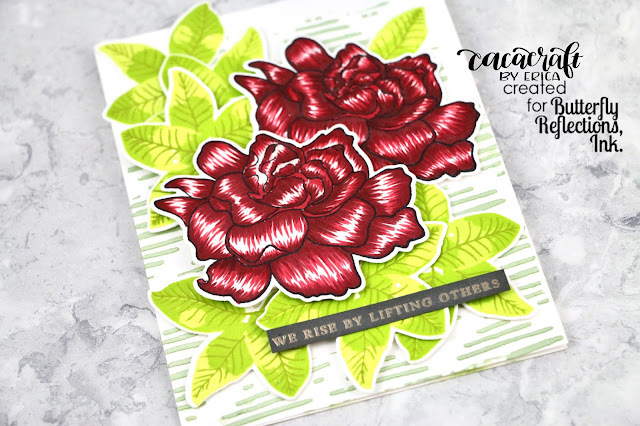 Erica on the BRI blog today with a big blooming card using Altenew’s Build-A-Flower Gardenia set. I have had this set in my stash since it was released and I haven’t used it until now but it certainly won’t be the last time. It’s gorgeous!! 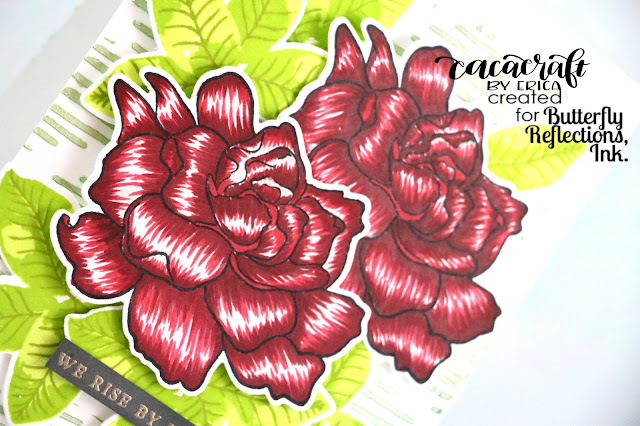 I started out by stamping the big bloom twice on Neenah Classic Crest card stock with Memento Tuxedo Black ink. 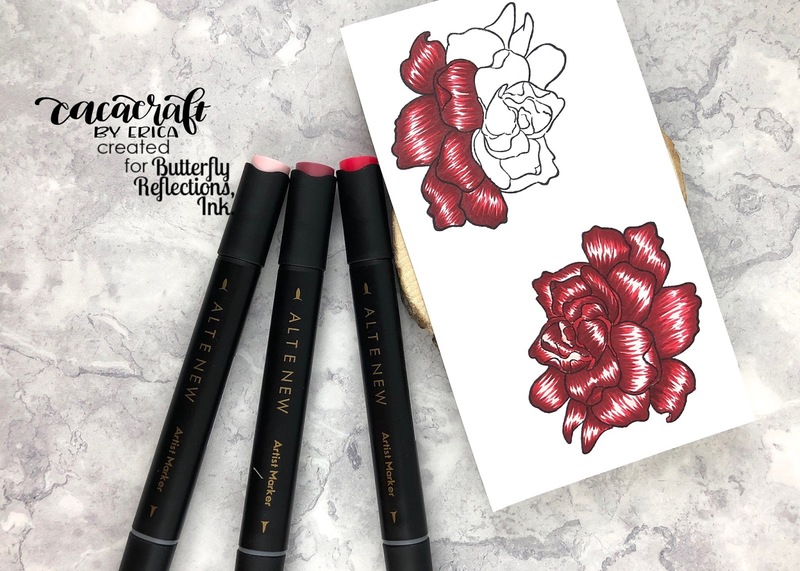 To colour in the flowers I used the red pens from Altenew’s Artist Markers Set A/Red Cosmos. I like colouring flowers using a flicking technique to create lots of textures, low and highlights on the petals. One of the flowers I made slightly darker as the idea was to place them in such a way that the shadow from the first flower would make the second one darker naturally. Does that make sense? Anyway, I coloured away until I was happy with the flowers and then moved on to the leaves. These I decided to use inks with instead of the markers. I might have gone slightly overboard (*gasps of shock* Erica never does that!!) and made 6 of them. If I don’t end up using them all, I will have some ready made for another card. That’s a win-win in my craft-room. 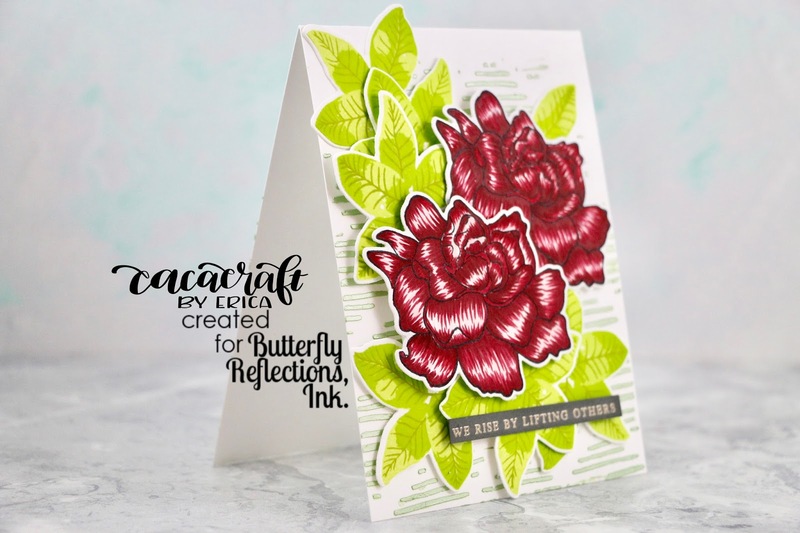 Using my trusted MISTI to layer up the stamps perfectly I stamped each layer with three of the colours from the Tropical Forest ink set, also from Altenew. I used Bamboo, Parrot and Olive. These are maybe my favorite combination of green inks. I love them! If you are short on space in your craft room they also come in handy mini cubes. 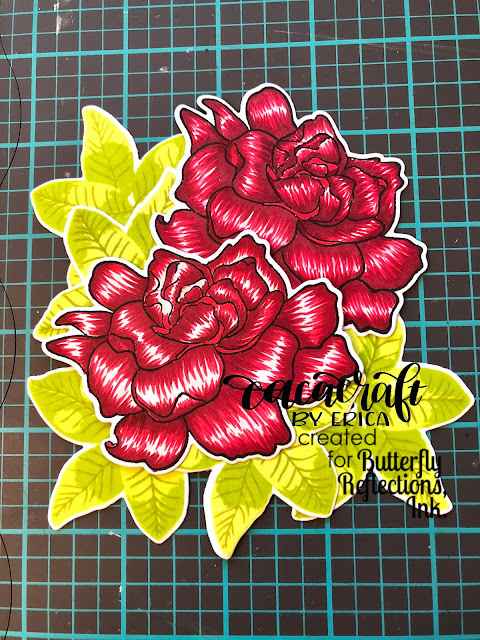 All the flowers and leaves were then cut out using their coordinating diecut(which comes as part of the stamp set) and put aside while I started working on the background of the card. I decided to use an Altenew stencil, Sketched Lines, and Nuvo Mousse in Spring Green, and I applied this directly to the cardbase. 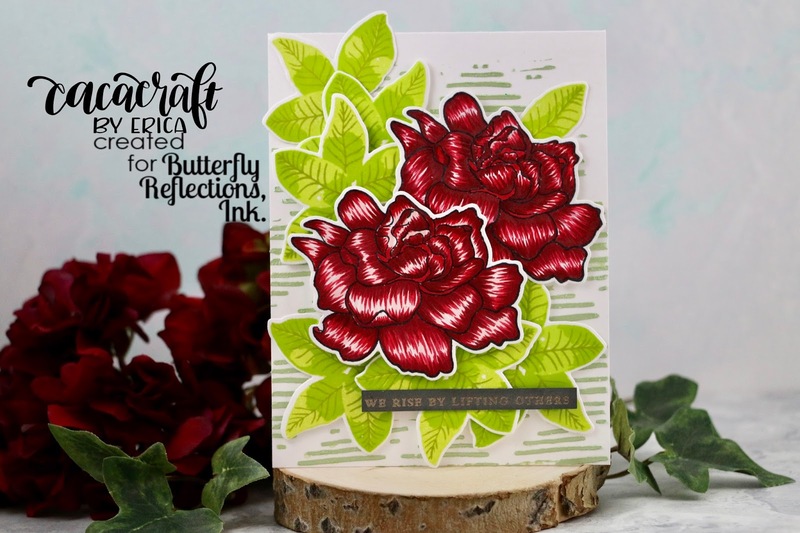 I like using Neenah Classic Crest 110# card stock for my card bases as I tend to load my cards up with lots of layers and bits and pieces, which require a very stable base. While the background was drying, I started puzzling the flowers and leaves together to see just how they would go on the card. To help with the placing, I use the grids on my work mat. This is especially helpful when your background is wet still but you want to get on with it. Using different thicknesses of foam tape, I layered up the flowers and the leaves (I did end up using all 6) and then set that aside. Sentiment wise I wanted to use one that came with the stamp set and decided to use the ‘We rise by lifting others up’. I really like that one and think it’s a lovely thing to say to someone who might be having a hard time. I heat embossed this with Altenew Platinum embossing powder on dark grey card stock and trimmed it down to a very slim strip. Once my background was completely dry, I added the flower & leaves cluster and added the sentiment strip to the bottom of it. It’s really hard to photograph shimmer well but this Nuvo Mousse is so shimmery and vibrant! It’s such a shame it doesn’t show up in the picture but I hope you get the idea. At the time of writing this, all the inks and Artist Markers I have used for this card are out of stock in the BRI shop so I have some affiliate links for you in case you can't wait for things to get restocked. If you use an affiliate link of mine, I get a small commission directly from Altenew at no extra cost to you but be sure to check if the item/s you want are back in stock here at BRI first. 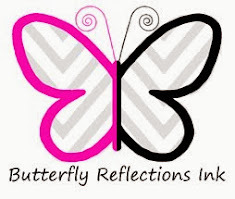 Shop small and support someone's dream! That’s it from me today but I will be back soon with more card making and jibber-jabbering! Have a great week! Lots of love and happy crafting!